If the NBA vote in April goes against the Kings will they still build the new arena? Probably not. You really need that committed "anchor tenant" to make it worth it. Yes, it only guarantees 44 events a year, but that guarantee is enough to make the numbers work for various reasons. For example, you won't get anyone to pay big bucks for naming rights if the name isn't constantly mentioned in the media for 8 months of the year. Arenas are good for economies simply because of what pops up right next to them - hotels, bars, restaurants, shopping. It creates buzz and having a major arena in the suburb of Natomas hampers attendance and interest. 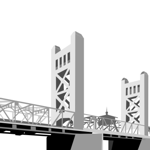 What if everyone visiting downtown Sacramento was able to walk to the arena while in town? Sacramento is lucky to have a mayor and former NBA player spearhead this project.